This movie recently debuted at SXSW and the studio decided to capitalize a bit further by releasing the trailer online today. The footage sets up the main conflict, as teased in the title. A poor young woman who works at a state park gets lost on a trail assignment that's a bit out of her depth and, unfortunately, stumbles upon a dead body. No cell phone signal. No map. All bad. There's some 80s throwback synthy score to help set the mood and plenty of unnerving wrenches thrown in the gears to make things interesting. Especially the girl vs bear showdown teased at the end. 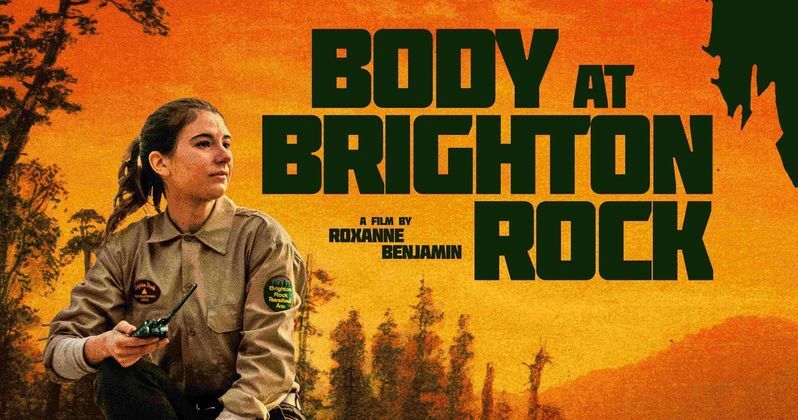 Body at Brighton Rock centers on Wendy, a part-time summer employee at a mountainous state park, who takes on a difficult trail assignment in order to help out her friend, while trying to prove to her co-workers that she's capable of handling the job. When she takes a wrong turn and ends up deep in the backcountry, Wendy stumbles upon a dead body, which may actually be the scene of a crime. Stuck with no communication after her radio, Wendy must stay and guard the site while fighting the urge to run. It turns into a long night deep in the wilderness, facing down her worst fears and proving to everyone, and herself, that she's stronger than everyone thinks. The studio has also released a new poster, which we've included below. The cast includes Karina Fontes, Casey Adams, Emily Althaus, Miranda Bailey, Martin Spanjers and John Getz. We'll have an interview with Roxanne Benjamin coming as well a little closer to the release, so be on the lookout for that. Body at Brighton Rock is set to hit theaters and on demand on April 26. Be sure to check out the new trailer form the Magnolia Pictures & Magnet Releasing YouTube channel below.